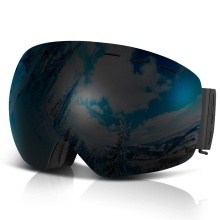 Lixada series dual lens goggles featured with antifog, antiwind and 100% UV protection to protect your eyes when skiing, snowboarding, snowmobiling and other snow sports. Clear vision at day & night in all weather condition: Different lens VLTs offer great panoramic vision and clean sight for all the way on the slope. Compatible with glasses: The Lixada series snow goggles are compatible with OTG (Over The Glasses) to meet your habit of wearing glasses. Compatible with your own sport gears: The Lixada series snow goggles come with adjustable head strap which compatible with helmet and different head sizes from teenager to adult. 1. To avoid damaging of the anti-fog layer when cleaning your goggles, carefully clean the lens with a soft tissue. 2. Store the goggles at a dry & well ventilated place after use to dispel sweat & humidity. 3. Avoid scrubbing the lens too frequently as it may reduce the performance of the anti-fog coating. 4. Avoid using cosmetics when wearing goggles in case stains and discoloring of the frame&apos;s foam.